From Titleist: The 990 Iron features a "variable muscle back cavity with progressively biased weight throughout the set. Long irons are weighted to promote playability and higher ball flight. Short irons are weighted to produce lower, more controllable ball flight. Traditional V-grooves for consistent trajectory and spin performance." I pieced this set together from Play It Again for $50, got the 2 through the wedge, I just liked the look and feel of them. Added grips and have just been messing with them. The other day i took my 7 from this set and the 7 from my Cleveland TA5 set that i have used for 18 years to Golf Galaxy. I pulled the same club from a used Nike Vapor set and Titelist AP1set. I hit 10 balls from each. The AP1 7 iron hit farthest and unfortunately my Cleveland hit the shortest(165 avg) but this 990 was second(170 avg) and what was really surprising is the dispersion. The 990 was so much straighter than the other clubs. Don't remember the numbers but they were striking, no pun intended. Took them out Saturday and played 18 and shot my second best score ever, 82. I usually score myself by how many balls i lose and i can happily say i only lost 1. These irons feel great on impact but will let you know when you miss hit. I usually score low to mid 90s so this may just be a one time thing but I can't wait to get out and hit them again. Can't hit the 2 iron at all, the 3 iron....almost the same. More than likely that is the guy swinging the club. I have played Callaways , Ping ,Taylormade, the 990s are a definite game improvement club took them out to the course man awesome laser straight, soft feel killed greens regulation,these will stay in the bag,partners don't even notice the change.I wouldn't recommend the for high handicappers not very forgiving. I recently purchased these irons ( and boy-howdy am I glad I did ! ) my previous set of " sticks " were the DCI's that came before the 990's... played them for many a round... wish I would have made the switch long ago ... we all know technology has changed the world of golf , but if you like a iron that not only looks awesome @ address , but also feels like you hit a marshmallow when you center one of these things , then go find a set and buy them !! today !!!! p.s. yes the 2iron works , and it works as easy as a 6 iron !! awesome irons ... thank you Titleist !! Have used the 962b's on and off for the last 10 years but without playing each week now, these butter knives in the long irons are getting a little daunting, although awesome out of the rough. I have had the 990 heads for years and it was only when I started reading how good these were that I married them up to some 5.5 rifles, result is the best feeling iron I have used, the long par 3 and 4 iron is a perfect combo, thought I was getting close to owning a hybrid but not now. The 990 as reported is simply the best weight, best size head, best minimal offset, and best quality steel without being forged, possibly more generous lofts than modern irons but not a disadvantage at all. Considering these irons were made in 2000 they could be cult status in the next 10 years, great to use an iron which is a solid block of 431 stainless steel without plastic inserts, sockets, screws, and weights but performs ! Most solid irons I've ever hit. There may not be another iron that feels as good when you hit it flush. The thin topline also gives a great look at address and allows you to feel confident you will hit a good shot. Easy to shape as well. Best irons I've ever tried. I have tried all of the players clubs out there including the entire MP line of Mizuno and the various latest blades/CB's of Titleist. None compare to the 990. Easiest club to work and the most accurate. Average players should stay clear. Good players should beckon and expert players should buy them. These are THE best club ever created. I spoke to a hottie named Charlotte. Tried them all. Too many to list. I have played Ben Hogan Apex blade irons for most of my golfing life. As they are becoming more difficult to find (in conditions worth buying anyway), I have converted to Titleist. I recently bouught a set of mint 1982 Tour Models..love 'em. I was looking for a set of mimimal cavity back irons, non-forged that will hold up longer than soft forged. I bought a good condition set of 990's on Ebay for 60.00 - less than a set of grips. So I had nothing to lose. I am generally a consistent ball striker. I find that these irons don't provide any more help in regard to forgiveness than my blades. If you are looking to make the step towards blades, buy these. They are inexpensive so risk is low, and they will force you to learn how to make a good pass at the ball. When you learn how, you will love these. Disregard the reviews that claim these clubs to be forged. They are cast. Despite this fact, they are simply the best feeling irons I have ever laid my hands on and I've laid many. The profile at address is near perfection. When hit solidly, they are the longest irons I've ever hit yet the lofts are weak by today's standards. Lesser players should avoid these clubs and any other club that doesn't look like a garden hoe. Let me digress...these clubs are sublime and should be considered to be the bee's knees. They are like super fly TNT. I shoot low 70's and I'm the club champ. Have a good one. Why would I call customer service for golf clubs? I'm not going to list them. Rest assured I've tried just about all of them. 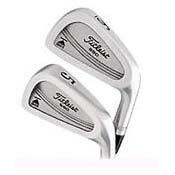 I am left handed and bought a set of Titleist DCI 990 irons when I saw them in the hands of Phil Michelson. I am far from a Phil but wanted to experience the same clubs that a great pro uses. Prior to that I was using very forgiving Cavity back irons. Wow what a difference! It took quite some time to make the adjustments for the 990s. These are S300 stiff shaft irons with heads as close to forged "tour ( muscle back) heads as it gets. The "sweet spot" is bigger than a tour blade but not by much . When you miss it lets you know it. It feels like hitting a brick with a a piece of Re-bar . Actually hurts some times. When you connect its like waving the club head through a soft piece of butter and WOW does the ball take off ! Once you get the "hang" of these beauties you get to understand why tour blade clubs were always a pro favorite....with slight adjustments in stance and grip you can hit gorgeous draws and fades that a cavity back tries to "correct" and eliminate. IMO.. these clubs are NOT for mid/high handicappers. They would only frustrate them . You need to have a reasonable and repeatable golf swing to get the most out of these clubs. Sadly , I'm in my mid sixties and don't have anywhere near the flexibility and lack of physical pain that I used to have. The clubs have become unplayable for me. I got it down to an 8 at one point and played through my mid 50s at a 10. No more...Hey enough of my whining..If you are in reasonable physical condition and have a good golf swing ( with a high swing speed for the "stiff" True Temper S300U shafts) you would LOVE these magnificent clubs. Sometimes older is way better than "the latest" If you find a set of these beauties in good condition, grab em. You will not be sorry.